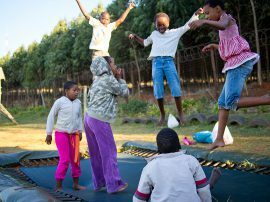 Etafeni Day Care Centre Trust provides holistic and sustainable support to AIDS-affected and vulnerable children and their caregivers. Located in Nyanga, Cape Town, where almost 30% of residents are HIV- infected and unemployment is above 60%, the Centre serves as a resource centre for the community in their struggle against AIDS. Income Generation Programme: Offers craft training to destitute, unemployed HIV-positive women and grandmothers. ‘Fit for Life, Fit for Work’ Programme: Teaches life and work skills to Nyanga’s unemployed young people. Mobile VCT and TB Screening Programme: Two nurses and five counselors offer HIV counseling and testing and screening for TB in informal settlements and at the centre. HIV/AIDS Counsellor Programme: Counselors offer health education, pre- and post-test counseling and run support groups from ten healthcare facilities in the Nyanga health district. Serving as a hub of integrated services, its multi-purpose day centre offers a range of programs for children of all ages. The Special Orphaned and Vulnerable Children’s (OVC) Programme provides infant care, a pre-school and after school care programs. The Vegetable Garden and Nutrition Rehabilitation Programme grows fresh vegetables that are used in nutritionally designed meals. Daily meals are prepared and served for the children and HIV-positive clients at the Centre. As they address the HIV/AIDS pandemic at a local level, Etafeni’s vision is to develop a model that can be replicated in not only throughout South Africa, but in other AIDS-affected developing countries as well. To that end, Etafeni was invited by the Vrygrond Development Trust and the Valoyi Traditional Authority Trust to replicate its model in their communities. These two projects are currently underway.